I previously paid $70 a month for a basic business phone landline from AT&T, with no extra services and awful customer support. Virtualpbx.com is 50% cheaper than AT&T with so many extra services. I had the service for about 6 months only had to contact customer support to help me setup the service with my computer. Also, wish they had a mobile app. Pros: I have never had to call customer support. I had an issue with my router that I have been trying to communicate and resolve with my internet service provider since January. After a 10 minute call with VirtualPBX’s customer support, I was able to properly configure my network settings, and issue is resolved. Thank you for your support. VirtualPBX, an original pioneer of cloud based PBX hosting, was founded in 1997 by voice-based application developer Stephen Lange. Focusing on small and medium sized businesses, the company has continued to expand its offerings with constant innovation. With a strong focus on flexibility and customization, the VirtualPBX has a unique offering of features previously only available to large businesses looking to adopt business VoIP. As a cloud based service, adopting VirtualPBX requires no hardware setup and all services are hosted on the company’s end. The provider boasts a robust 99.999% reliability promise, and has won over 30 annual awards (https://www.virtualpbx.com/benefits/awards/) for their services. With different Office and Dash plans to choose from, consumers can endlessly customize their calling features and connect the system with any existing analog, VoIP or mobile phones already used by their company. Dash plans aim to even further reduce costs to small business owners looking to easily add features synonymous with expensive enterprise systems, while remaining simple to adopt and monitor with a web-based portals. VirtualBPX even offers a Concierge Service to fine tune and optimize a calling system for your business needs, without any extra work. Package prices vary based on the number of lines supported. Office Plans: For medium businesses looking to outfit their office with a VirtualPBX solution, their Office Plans include unlimited minutes and even more calling features. Office plans also add the option to add metered VoIP lines, with a standard $4.99 per line, and additional cost per minute. Package prices again vary based on the number of supported lines. Small or medium businesses looking to cut costs yet maintain a robust VoIP system with features normally reserved to expensive Enterprise providers. Central Business Number to present a unified company image under one central telephone number. All employees from any location are reachable by one central number. Mail Only Extensions allow VirtualPBX extensions to be designated as mail only to receive only voicemails. Easy Web-Based Management for easy system configuration, graphical web-based tools accessible from any browser and varying levels of administration tools that can be designated for employee level. Multiple Numbers let you set up more than one incoming business number. No Busy Signals since calls are answered through the VirtualPBX system that has access to hundreds of lines to never ring busy to your customers. Mission-Critical Fault Tolerance incorporates unique systems to assure minimum downtime. Failed equipment is automatically isolate and removed from use and calls are rerouted to work equipment. Comprehensive Data Security to ensure protection of any information as it is routed through the VirtualPBX datacenter. Multiple Phone-Type Freedom allows you to connect calls to any device from analog phones, to VoIP phones and even mobile phones. 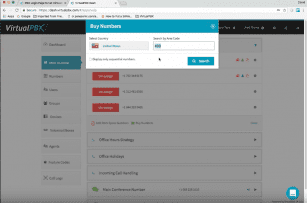 Virtual Extensions allow employees to activate their extension from any location to accept inbound and make outbound calls. Follow-Me Calling so you can provide four different numbers to reach an employee when they are out of the office. SelectRoute lets callers route themselves by any numeric identifier, up to 9 digits, of your own choice. Zip codes or product codes can guide callers to the proper extension. Day and Night Modes so you can set automatic changes in call answering, routing and messaging based on the time of day. 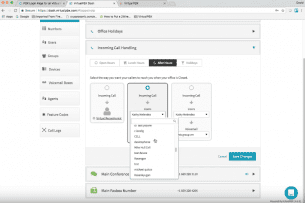 Configurable Call Preview to change what information will be displayed to employees when answering incoming calls. Call Screening asks callers to speak their name so you know who is on the line before answering. Do-Not-Disturb function to prevent any incoming requests to specific lines or extensions. Auto-Attendant is a virtual assistant that can be programmed to replicate the same functions as a human attendant to direct callers to departments. Music or Information on Hold lets you decide from over hundreds of options in the VirtualPBX Jukebox, or upload your own music. Automated Directory helps your callers find a specific person when they don’t know their extension. SmartID utilizes the display functions on your phones to provide information on incoming callers and even control what shows on outgoing caller IDs. Greeting Manager allows you to record your own greetings, use text to talk to type in a greeting for callers to hear, or even order standard recordings from VirtualPBX at $25 per blocks of 75 words. A partnership with Snap Recordings lets you choose from over 80 voice actors in three languages and multiple accents. Automatic or Manual Call Recording to choose manual recording or preset all or certain extensions to record on every inbound or outband call. Storage solutions let you listen to, delete and store messages directly into your Dropbox account right as its saved from the management portal. TrueACD Queues expedite callers through your phone system by assisting callers who know what they want but not who can help them by organizing agents departmentally. Conferencing capabilities to host your own teleconferences. 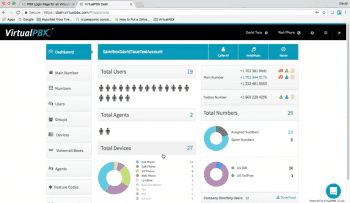 Call Blocking from VirtualPBX is fast, secure and reliable with the web-based management tool. Web Callback to route your calls through an internet connection while traveling. Virtual Calling Card to place calls from your own toll-free phone number. Multi-Stage Dialing can provide a single outlet for a company with multiple businesses to all be housed under the same virtual roof. Never Full Mailboxes hold onto all your messages until you’ve checked them. Centralized Messaging to manage multiple lines and send messages from one easy to access platform. Voicemail interrupt lets you screen calls and listen to messages while they’re being recorded, and answer at any time. Message Notifications via text, email and voicemail audio recordings. Paperless Fax to send documents without the need for a virtual machine. Fax Viewing Options allow you to view, store and save frequently faxed documents in your VirtualPBX account. As one of the original pioneers of hosted PBX solutions, VirtualPBX offers a lot more than other providers. With a massive feature list, competitive pricing and over a decade in hosted PBX solutions, the company offers some of the most compelling plans for small or medium sized businesses looked to upgrade their calling services. A strong set of features and reliable system sheds some of the headache without any need for any maintenance or setup of your own hardware. 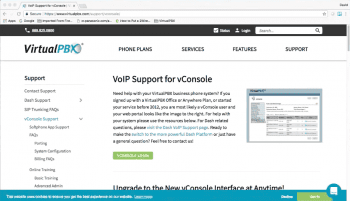 What Do You Think of VirtualPBX?